One of the absolute coolest parts of my recent Blogging Adventure to L.A. was a cocktail hour reception hosted by ABC TV. In truth, it was more than an hour, and for those keeping score at home, I only had two cocktails. I was really shocked that there wasn’t other press or groups there. Just us, the celebs and their publicists. That was it. The event took place at the Walt Disney Animation Studios, which has to have one of the coolest front doors I’ve ever seen. 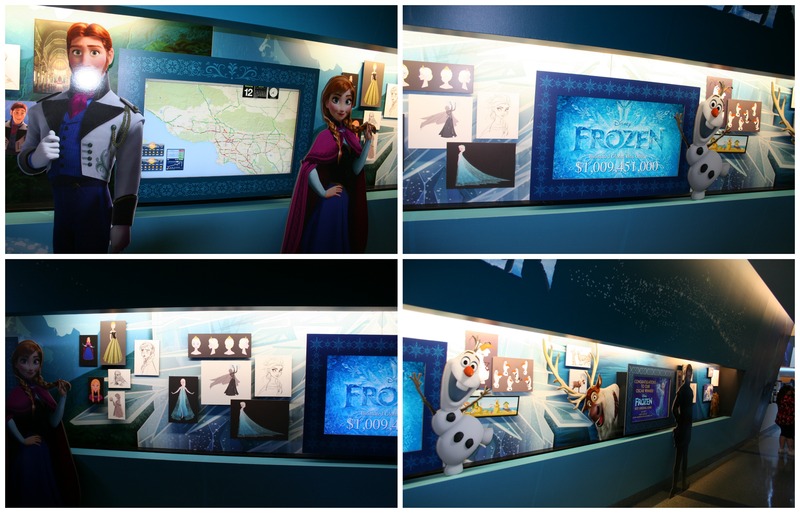 Besides being welcomed at the front door by Anna and Elsa, the lobby opened into a gorgeous Frozen display. I just couldn’t resisting taking a photo of the “No Photos” sign. After “oohing” and “ahhing” at Olaf and Company, we made our way to the terrace for the Moms of ABC Event. I’ll start off with the most important question on everyone’s mind: The food. The evening was super casual, with bloggers just grabbing a seat wherever and the ABC Moms just sitting down with us, getting up every 10 minutes or so to join a different group and chat. There was even an area off to the side with a big ABC backdrop where we could take photos, which every single actress was more than happy to oblige us with. The first mom to chat with us was Patricia Heaton (@PatriciaHeaton) from ‘The Middle.’ It was great because the next day we were going to have our The Middle Set Visit! So we got to chat with her about that, as well as what it’s like being a mom and an actress. She has a child heading off to college but still a young one at home, so it’s an interesting transition for her. Patricia was real sweet and so incredibly down-to-Earth, it felt like we were all just hanging out on our deck, enjoying the gorgeous weather. 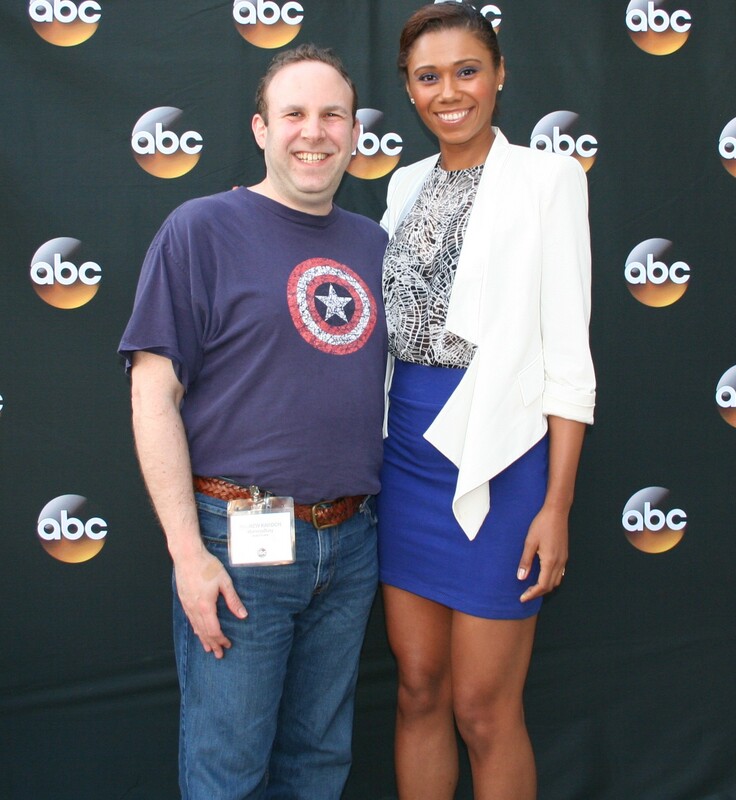 Next up was the one woman I could not wait to talk to because she plays Agent May on Marvel’s Agents of S.H.I.E.L.D. 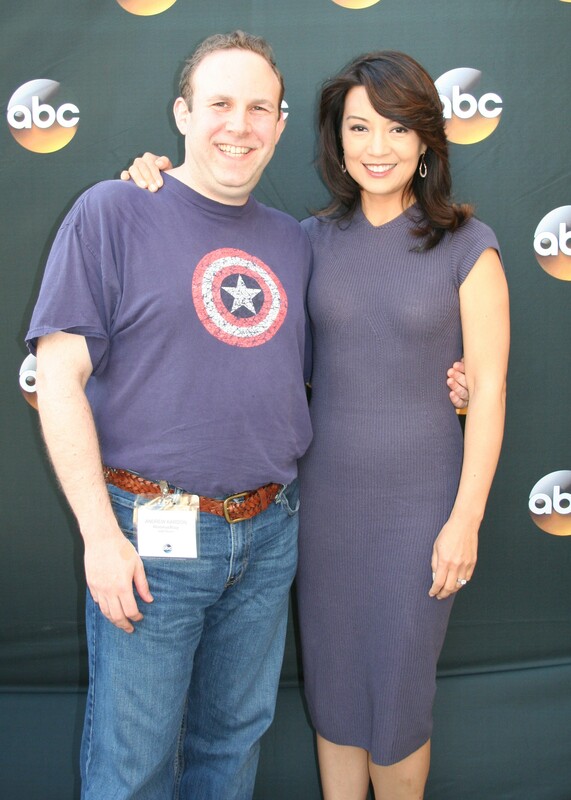 Yep, Ming-Na Wen (@MingNa). She was as excited to talk to all of us as we were to chat with her. She was fascinated with blogging and really played up the fact that she’d love to get into it. She joked about her kids and how she’d go out of her mind if she had to homeschool them. I also made her incredibly jealous when I told her that we had already seen Captain America: The Winter Soldier. She hadn’t yet, but talked about how closely it tied into the S.H.I.E.L.D. TV show. Apparently when they first started the TV show, they knew exactly where things were going with the movie, so they had it all planned out in advance! Then there’s the Trophy Wife herself, Malin Akerman (@MalinAkerman). This mom-in-real life was seriously hilarious and so much fun to chat with. We joked about the Muppets and she started telling us how much we’ll love the big two-part wedding episode of “Trophy Wife,” which features some Muppets! Oddly enough, we were screening that very episode later that night! (And she was right: It was hysterical!) While I had such a great talk with Malin, I later kicked myself (it’s true, I still have the black-and-blue marks to prove it!) for not asking her about her role in the comic book movie Watchmen! That’s one of my all-time favorite comics and I was in full Trophy Wife mode so I didn’t even think about her involvement in that awesome film. I did, however, chat it up with Malin on Twitter. She’s great to interact with her fans so I highly recommend following her. Even the word “retweet” sounds amazing coming out of Toks’ mouth. I’ll admit, I have never seen the show The Neighbors. But after sitting down with the beautiful (and tall!) Toks Olagundoye (@ToksOlagundoye), I will most definitely be catching up on it. She was such an incredible delight. Insanely gracious and humble. She shared a wonderful story about how she was working as a hostess after being on a show, only to have her former co-star (who went on to another show) end up at her table. Imagine the awkwardness of that one. But he was wonderful to her and reached out to her to congratulate her when she landed her role as Jackie Joyner-Kersee on The Neighbors. Morale of the story is be thankful for everything that you have. What really got to me about Toks, though, was her accent. She’s from Nigeria and I just loved hearing her speak. When she was talking about Twitter and uttered the word, “retweet” I honestly made her repeat it just so I could hear it again. She’s another new Twitter buddy of mine and I see some really big things in her future for sure! @Mommys_Busy Haha! Thanks! So nice meeting all of you! 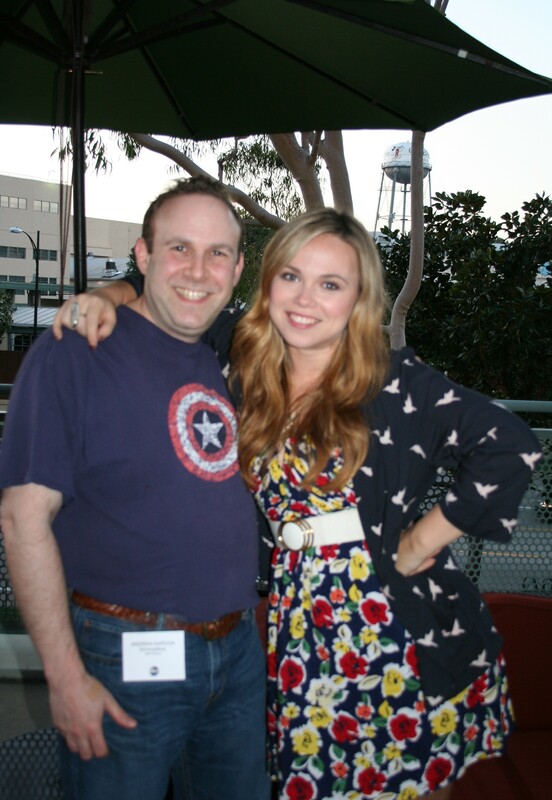 Then there was Amanda Fuller (@amandafuller27), who plays the single mom Kristin Baxter on Last Man Standing. This petite, firecracker of a blonde was just a total hoot to chat with. Our group could’ve spent all night joking around with her about life in L.A. and playing a single mom on TV. But alas, our fearless group leader had us on a tight time schedule, so we had to eventually depart for the rest of the evening’s events. 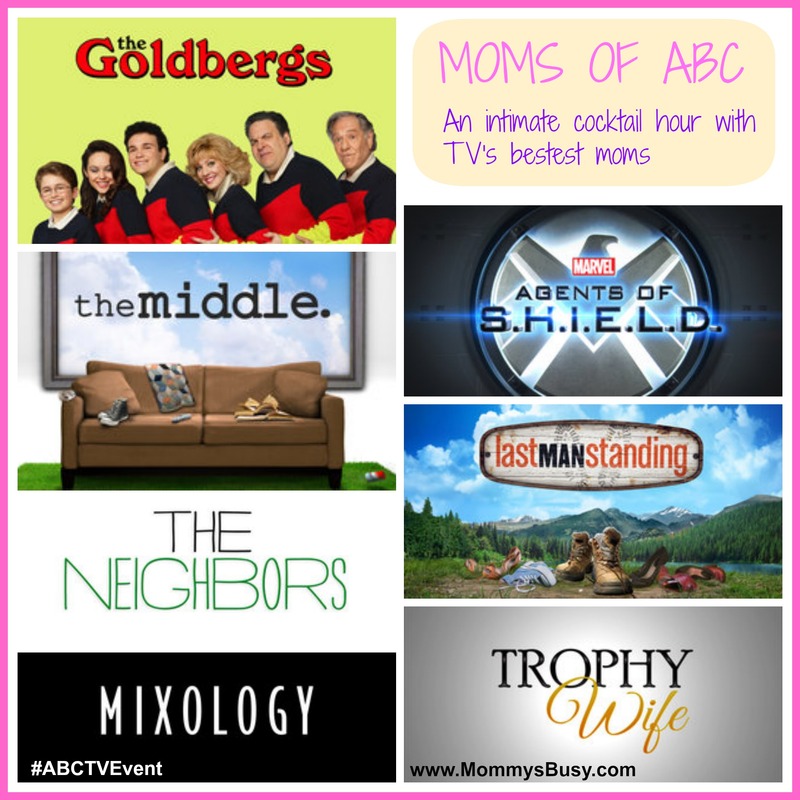 There were a few other ABC Moms that I unfortunately didn’t get to spend too much time with including Wendi McLendon-Covey of The Goldbergs, and Frankie Shaw and Alexis Carra of Mixology (@alexiscarra). The “Moms of ABC” evening was really one of the highlights of the trip. Everything from the location to the food to the actresses themselves was just perfect. My only complaint is that I wish we had more time to just hang and chat with these incredibly talented, funny and so down-to-Earth celebrities. The ladies are all so beautiful! Its amazing they were all in one place for you to meet so many! Im so jealous! 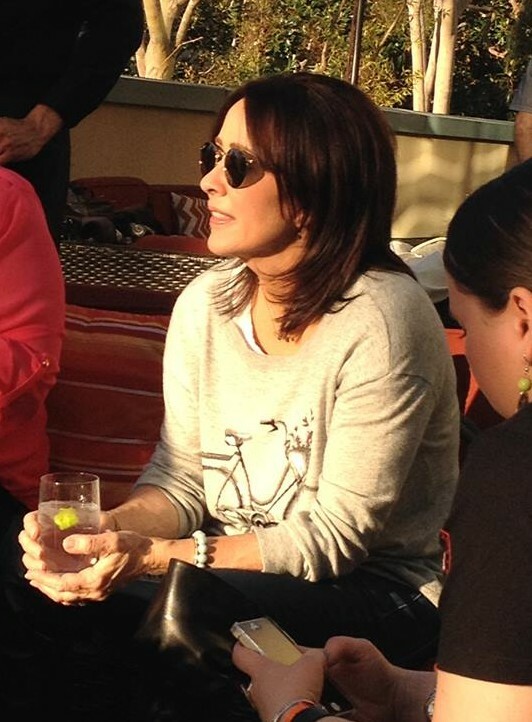 I adore Patricia Heaton! She’s so talented. How cool that it was just you bloggers there! Agents of SHIEL is on my watchlist. My brother & I are sooo excited to see the shows. We missed the beginning because of his work. wow all the celebs you get to meet! you are such a great blogger! especially the best GUY blogger i know for sure! ***BLUSH**** You’re too sweet, Courtney. Thanks. Hope you liked the coverage! i bet the food was great! Wow – what an event you went to!!! I love that Elsa and Anna greeted you at the entrance. That is my daughter’s favorite movie right now! Sounds like you had a great time! You got to meet some wonderful actresses! What a great opportunity! I would have been totally star struck. You looks so at ease with all of them. It’s nice to hear that they were all down to earth. It sounds like you had a wonderful time. It is nice getting to see you at this amazing event. You sure got to meet some really neat people, and I bet the drinks were great. It looked warm out and you did not even need a jacket. What a awesome place for you to be! Love Wendi in The Goldbergs and of course Ming-Na Wen 🙂 Great post! !